Lee Canipe serves as the pastor of Murfreesboro Baptist Church in Murfreesboro, North Carolina. He has also taught in the department of religion at Chowan University. Before coming to Murfreesboro, Canipe was a doctoral fellow in the J. M. Dawson Institute of Church-State Studies at Baylor University. He and his wife, Hilary, are the parents of a daughter, Helen, and two sons, Watt and Peter. What were you hoping to achieve with Loyal Dissenters? My primary objective in writing this book was to help my fellow Baptists in North America recover the ability to talk theologically and biblically about our freedom as Christians. It’s a skill I think we’ve largely lost because we live in a culture that, at least for the last two centuries or so, hasn’t required us to talk about freedom in distinctively Christian language. We’ve let the First Amendment to the Constitution do our heavy lifting, and as a result, our theological muscles have grown a bit flabby. 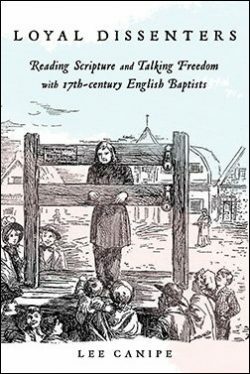 If this book moves just one Baptist to stop and wonder, “What are we really talking about when we talk about freedom?” then it will have done a good day’s work. I’d be thrilled if our future conversations about religious liberty incorporated more Jesus and less Jefferson.